This is an interesting post by Shannon of Country Crossroads that appeared in the Manitoba Co-Operator. She shares her experiences at the DIY Homesteader Festival at the Interlaken farm near Fraserwood, Manitoba. The festival was in 2013, but the information still applies today. 350 people showed up to learn about homesteading skills like cooking from scratch, raising chickens and goats, carpentry, canning, preserving, soap making, hunting and fishing, and natural remedies. There were also workshops on wilderness survival, and beekeeping. 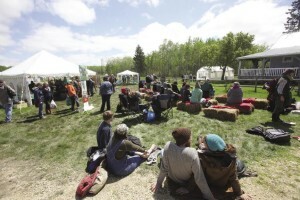 One of the benefits if the Festival was bringing like-minded people together to discuss learning the homesteading skills of an older generation. The homesteading movement is about living a more natural, self-sufficient lifestyle. Many people won’t be able to farm a plot of land in the country. But they can grow herbs and veggies in container gardens. They can also learn how to make natural remedies to replace chemical-laden commercial products. Another skill is learning to cook and eat healthy food. If you can’t grow your own food, you can find healthy sources for foods you can’t grow themselves. So you can apply a lot of homesteading skills to your life no matter where you’re living. If you’re at all curious about homesteading, click on the What is Modern Homesteading link below.